I'm Here. I'm Queer. What the Hell do I read? : Was Charlie and the Chocolate Factory Racist? Is it STILL Racist? And How Can Reading It Be Okay? Was Charlie and the Chocolate Factory Racist? Is it STILL Racist? And How Can Reading It Be Okay? Okay, I just read this amazing blog entry by Philip Nel "Can Censoring A Children's Book Remove Its Prejudices?" 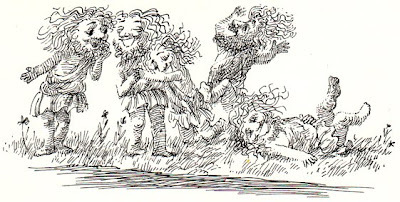 But here's what's fascinating: Philip argues that in some ways, changing the skin color in the illustration made it harder for readers to SEE the racism, because little else has changed in the structure of the story that was racist - Willie Wonka is a white European who goes to a jungle and brings back a race of people different from himself who are his happy slaves. That's pretty disturbing, and when I stop and think about it, I realize that until Philip's article I never stopped and thought about it. Not once. But if I'd read the original, and seen the dark-skinned Oompa-Loompas, maybe I might have been more sensitive to the racism on display. I mean, I read the book with my daughter, and we didn't talk about it. We watched both versions of the movie, and it didn't come up! Philip wonders what's the best way to approach literary classics with offensive or racist moments, and ultimately suggests using them as springboards for discussion. I'll be talking with my child about "Charlie and The Chocolate Factory," the Oompa-Loompas, and race, and how even though it's a story, a great story, there are things about it that can trouble us. Things for us to discuss. I don't want to ban "Charlie and the Chocolate Factory." I don't wish I'd read a different book to my kid instead. But like a prism held to a beam of light, I want to help her look deeper at the story. Separate out the parts. I want to filter it and discuss it and use it as a way to address inequality and the wrong-headed ideas of racism with her. Because I think talking about what troubles you about a book with your kid is maybe the best way to deal it. And giving your child that gift of literacy - not just to read but to analyze and understand? Maybe that's the real golden ticket. Interesting! Weren't they orange in the Gene Wilder movie? Also, in the movie you just see them more as people who work for at the factory...not as slaves. (Really weird people with all that singing. I'm still haunted by that singing.) But I did read the book to my son and was pretty blown away by how much they come across as slaves. 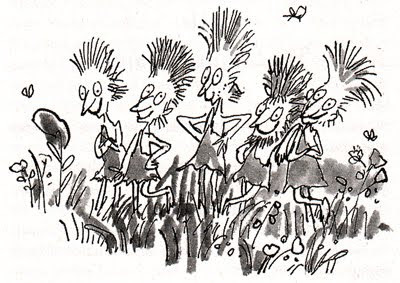 It would have been more obvious if they were pygmies from Africa though, as that is a real place with real people. I think it's important, when reading a book that wasn't written in our own time, to point out that the things people think are acceptable change constantly. It's not fair to judge a writer totally based on our own morality, which didn't exist at the time. All a writer has to go on is the morality of his or her own time. Who's to say that one day books from today won't be considered disgusting because their characters casually eat meat? Or because families have more than one child? Or for some other prejudice we don't even notice we have today? 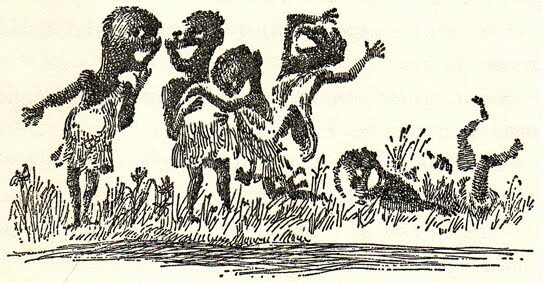 Roald Dahl actually lived a long time in Africa during the colonial period and I doubt he was more racist than anyone else of his generation-- and as you know, the illustrations aren't necessarily cleared with the author. As times changed, the illustrations changed... because times change. I read "Charlie and the Chocolate Factory" as an adult and the racism, or rather, the condescension with its racist connotations, struck me right away, but I don't think it's so obvious to children. 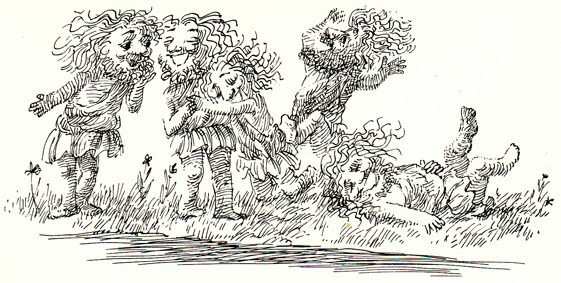 A lot of things that bother adults go right over their heads, like the Christianity in the Narnia books or the racism in Dr. Doolittle. It doesn't ever hurt to point these out; but it doesn't necessarily hurt kids to realize times change and that they should not make the a-historical mistake of expecting writers from another age to take the same things for granted that we do. I'm thinking much the same racist connotations apply to the Indians (as they were called) in Peter Pan. I haven't read the original book in a while, but the Disney version still makes me cringe. They're not slaves like the Oompa Loompas, but they're definitely stereotypes. Wondering what others think. Hi everyone - thanks for your comments so far! Yeah, they were kind of orange in the original movie, and then they were all kind of clones of each other in the newer movie with Johnny Depp, which frankly was disturbing in a totally different way. Julie S, I think you're right, that it's hard to judge past writers on our current world-view, and I agree - the racism is NOT so obvious to children. And I think that's why it's so important to talk to kids about it - about how our understanding of what's okay (and what's not) does change over time - and that if it was written today, maybe the Oompa-Loompas would need to be empowered somehow so they wouldn't read as "slaves." I'm so glad we're having this conversation - it's exactly what Banned Books Week should do - get people talking about the issues IN books! Aren't Santa's elves as slaves as well? Slavery and exploitation have long been tacitly endorsed in our lit and film. But as was said before, much of it is simply indulging in the tolerances of the time. I also agree that using these texts as teachable moments is positive thing. The world is complicated, pretending it isn't so doesn't do our children any good. This is how we help teach our children how to make their own moral decisions. I had such a moment recently when I watched "Twilight" with my tween daughter: manipulation even from sparkly boys with symmetrical jaws and super powers is still manipulation. Santa's elves!!! Oh my gosh!!! It's such a great example of how when we grow up with this stuff, it's hard to see how wrong it is - how it comments on subjugation of others, how. We tacitly approve of that by sharing the story... And yet, better to share the story and interpret it, analyze it, discuss it... Much better than banning it and, as many have said, making it contaband that no one helps kids figure out! And yeah, that Twilight thing is so important to talk to teen and tween kids about - it's a great launching point for discussing just what IS a healthy relationship. That is...pretty frightening, actually. This was one of my favourite books as a kid, and I never twigged to the racism which, after reading this post, seems blatently obvious. And I come from a mixed race family! Maybe it would have been better (though less comfortable) if they had left the Oompa-Loompa as black? In terms of the acceptance of slavery and exploitation, HP's house elves were one of the most disturbing things I've read in recent years. I think it's the way that all the 'good' people in the book endorse this slavery (as do the elves themselves), and the one character trying to change it is treated like an interfering busybody in the text that really got to me. If Santa's elves are slaves then I'm going to be really depressed. I mean come on....we're talking about SANTA!! I think I might have to write a Santa's Elf-as-slave short story now... LOL! I didn't even THINK of the house elves in Harry Potter. Yikes! Hmmm... now I'm thinking! Wow! I'd read the book and seen both versions of the movie and I never ever thought of that! Thanks for pointing it out. I remember reading this as a Kid and I can tell you I was more disturbed by the orange green haird weird things than the oompa loompas from deepest darkes africa that I remember reading about as a child. It was MORE racist to change them. I truly believe that pointing out "racism" is more racist than racism itself because it requires the FOCUS to be on race, which is particularly rich when it is usually a person not from the race that is being depicted as "a racist sterotype" that derives for themselves those racist conclusions.